Condos on Yonge Street – Is it becoming overdeveloped?! The Toronto condo market is still moving forward at an astonishing pace. There are cranes all over the city – no neighbourhood (well, perhaps except Kensington Market!) is safe – there are even mid-rise buildings going up in Leslieville and the Beach! However, the most notable stretch of land experiencing growth is Yonge Street – specifically between Dundas and Bloor. In fact, there is so much development and proposed building that City Planner Jennifer Keesmaat is considering doing what she can to slow down the rate at which the buildings are going up to ensure that the infrastructure keeps up and the neighbourhood remains livable. There was an article in Metro recently about what’s happening, and the numbers are staggering. Over 1,600 storeys have been proposed for that strip of Yonge and even if it were just eight units per floor, if you do the math, with one person in each unit, that would add another 13,000 people to this part of Yonge Street. Two people in each unit? 26,000! This in addition to the people who are already living there. While lack of infrastructure is a very real concern, a bigger concern to me is who these condos are geared towards, what is the demographic? With the rising cost of detached and semi detached houses in the city, the preferred type of home for families, more condo units need to be built with two or more bedrooms (and not glorified dens) and the neighbourhood planning has to include schools, parks and other amenities that families need. Developers tend to build smaller units because they are priced lower and therefore easier to sell. However, those units tend to attract investors who are looking to rent out to students which in turn affects the retail and restaurants that move in. We really don’t need any more fast food joints, do we?? We also run the risk of losing the heritage aspect of Yonge Street. The city has tried to create a heritage plan with setbacks. The whole idea of digging down on Yonge is an impossibility because of the subway – parking would have to be above grade and that creates a problem, but they’re building buildings with less parking but not investing into infrastructure. It’s not just happening along Yonge Street, either. There are massive towers going up along Church Street at Wellesley and Carlton. These condos look like they’re geared towards a student population and again, it’s a completely different commercial landscape, which isn’t conducive to families or a mature audience. Quite simply, the Church-Yonge corridor is becoming overloaded. All this development is missing out on the empty-nesters and down-sizers – it’s not geared toward them. The city and developers need to figure out a way to build more mid-range price point two and three bedroom units for families and for down-sizers instead of only focusing on investors or transient owners who want to exploit the rental market or younger demographic. The solution is to build apartments for families and create communities rather than just building towers. They’re doing that at Regent Park and construction is beginning at Alexandra Park as well. The proposal for Mirvish Village also looks to be something that’s well thought out – they are trying to create a neighbourhood that hits a wider demographic rather than focusing on a particular kind of buyer. They’re hitting different kinds of lifestyles and it feels more balanced. 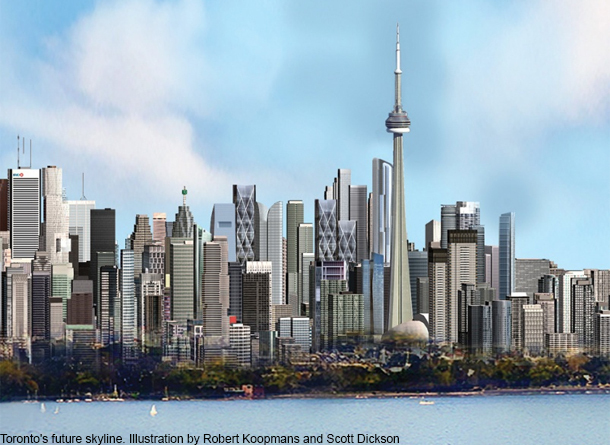 Perhaps this article from Toronto Life will accurately predict the future of housing, where skyscrapers will incorporate residential, commercial and office space as well as schools, libraries and parks. If you have any questions about the Toronto real estate market, I am always available. Please don’t hesitate to get in touch!